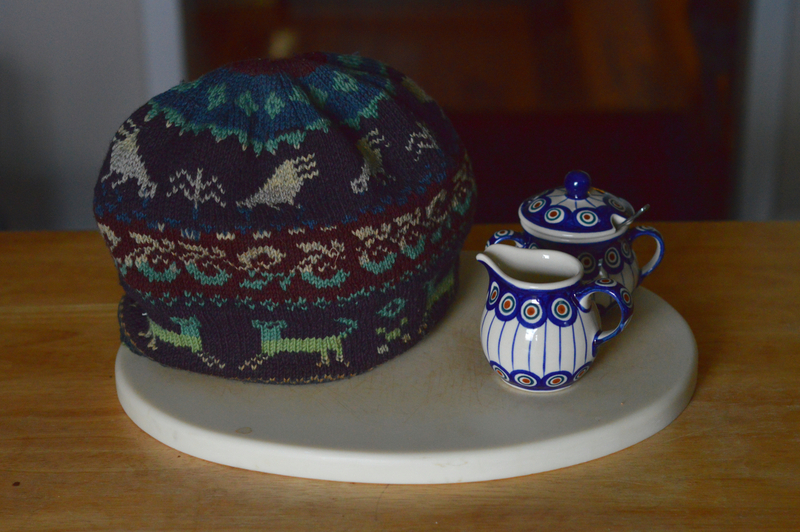 Many years ago, when I decided to learn how to do stranded colourwork, I made a tea cozy. It was an ideal project for the purpose: there was room to experiment with colour and pattern—I used a few charts from Priscilla Gibson-Roberts & Deborah Robson’s classic, Knitting in the Old Way; it was big enough that I’d get lots of practice but not so big that it would never get done; I could do the top shaping in plain rows to keep it simple; and if it turned out wonky, so what? I wasn’t planning on giving it away or wearing it in public. I’d have something useful that I could be proud of (hopefully), and that wouldn’t break my heart if it wasn’t exactly right. It didn’t even have to fit perfectly, so long as it fit over one of my teapots. As it happens, it turned out pretty well for a newbie project (though some of the colour combinations were…less successful than others), and it’s served me well for lo these many years. The old cozy has one flaw, though. I made it back when I didn’t think much about the fitness of a yarn for its purpose, and used a worsted spun sport weight wool because I liked the colours and feel of the yarn, and because it was a deal. (If I recall correctly, it was an Elann limited edition yarn that I went a bit nuts over. I still have a couple of sweater quantities deep in the deep stash. It will be perfect for a southern sweater. Which I will make, honest.) Worsted spun yarn is strong and smooth and has a minimum of trapped air, so it’s great if you want drapey, durable, and defined stitches, but a sport-weight worsted spun yarn is not the best choice for an object whose main function is to insulate. I lined the cozy in brioche stitch to use up a colour I wasn’t delighted with, which gave it some insulation, but I was also a newbie at brioche and the stitches were loose and floppy. The cozy keeps my tea warm, but not for as long as I’d like. You know what does insulate well? Lopi yarn. 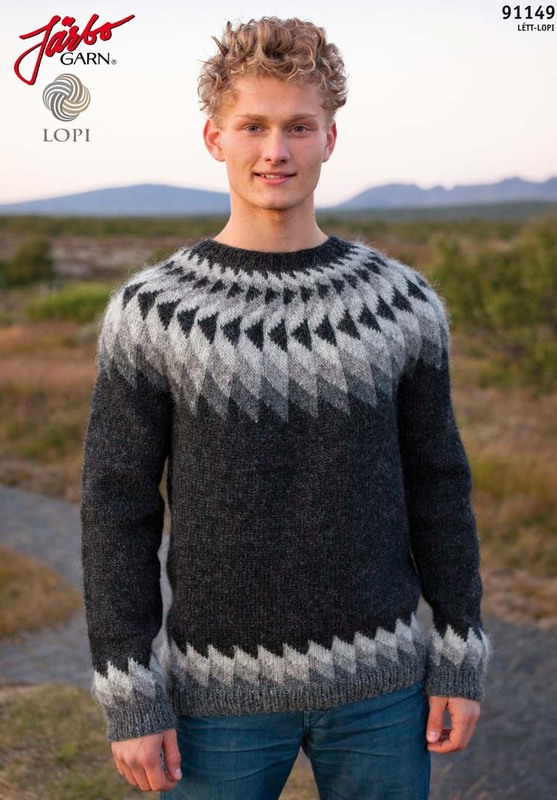 Lopi yarn combines the short, downy thel and the long, coarse tog of the Icelandic sheep’s fleece into an airy, loosely-spun yarn, making gorgeous, hard-wearing sweaters that will keep you toasty warm, even in Iceland. Such a sweater would be heatstroke on the hoof here, or I’d have a closet full of them. 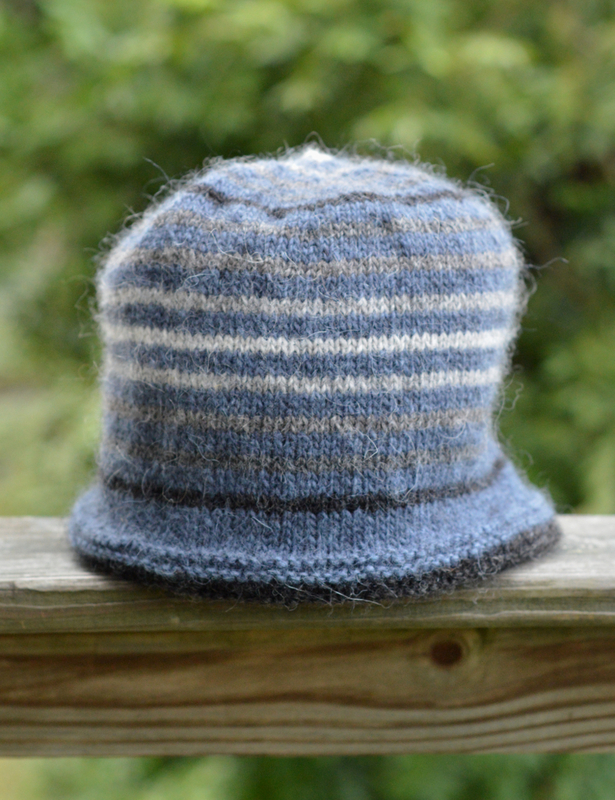 However, those beautiful yokes are a great basis for a tea cozy: a lopapeysa for the Deep South, one without the big project commitment. A lopapeysish, if you will. 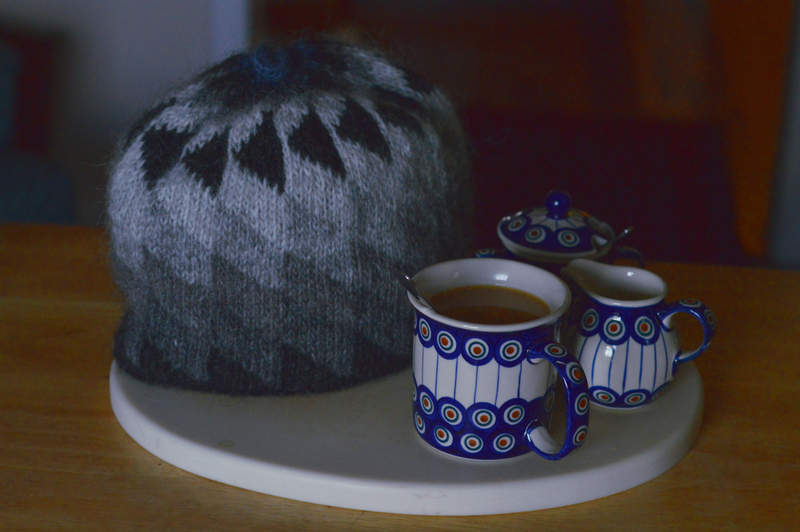 A bit of research tells me the Icelandic for tea cozy is tehetta, or ‘tea hood’, which I find somehow pleasing, so that’s what I called the project. 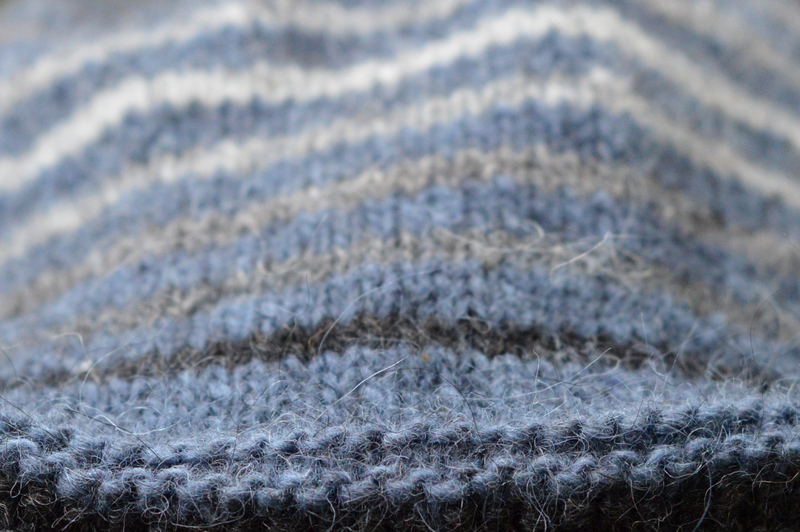 I started with a sweater I’d admired for some time: Jón by Hulda Hákonardóttir. 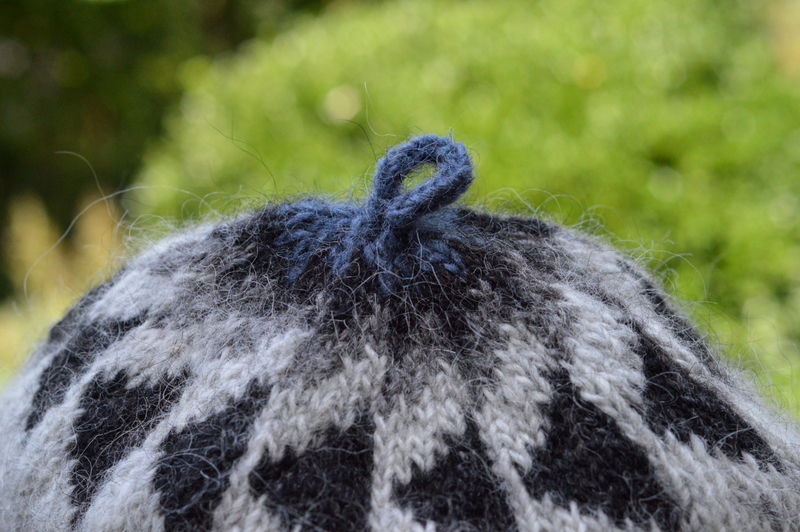 * It’s in Aran weight, so the fabric is considerably thicker than the old cozy, too. The Swedish version of this pattern is available for free from Järbo Garn, and you can buy the English version from Patternfish. I already had a cozy the right size to take measurements from: for my large teapot, I’d want a cozy that was about 24″/61cm around and 9-10″/23-25cm high. Generally, I’d say the circumference of the pot plus about 3″ is a good rough measurement for circumference; you can check as you go for the height. The recommended gauge for this sweater and for the yarn (Istex Létt-Lopi; full yarn info below) is 4.5 sts per inch/2.5cm and the pattern repeat is 8 sts, so I went with 120 sts for a stitch count divisible by 8 that would give me some wiggle room for gauge. (It doesn’t have to fit precisely, and too big is better than too small. I couldn’t be arsed to swatch. It’s a tea cozy.) The US6/4.5mm recommended needle size gave a fabric I liked, so I stuck with that. I followed the yoke chart with two modifications: I added an extra shade of grey because I could, and started doing the decreases more frequently once I got close to the right height. I did the last few rounds in blue, decreased to 4 stitches, and made an I-cord loop for the top. I picked up stitches around the bottom in blue, did 3 rounds of garter stitch, and switched to a US5/4mm needle for the lining. It became clear pretty early on that one ball of blue wouldn’t be nearly enough for the lining, so I added stripes in the same greys as the outside. Through no clever planning on my part, I ended up being able to go all the way from dark to light, back to dark, and back to light again. And now, I have my own lopapeysa. Okay, my teapot has its own lopapeysa. Which, here in the sweltering south, is the best way to enjoy one. * Jón photo copyright Istex, used with permission. I would wear your tea cosy gladly. Gorgeous! Heh. If anyone could carry it off, it’s you. Thanks!